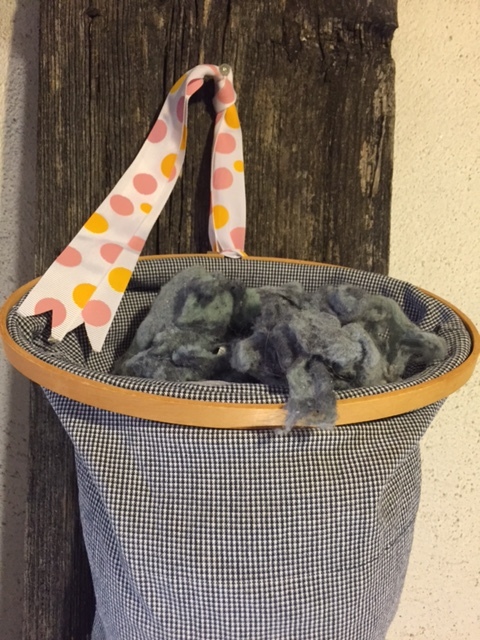 June Craft Challenge – use an embroidery hoop in a new way! I found my wooden oval embroidery hoop at one of my “frequently” visited thrift stores for a mere $0.25. 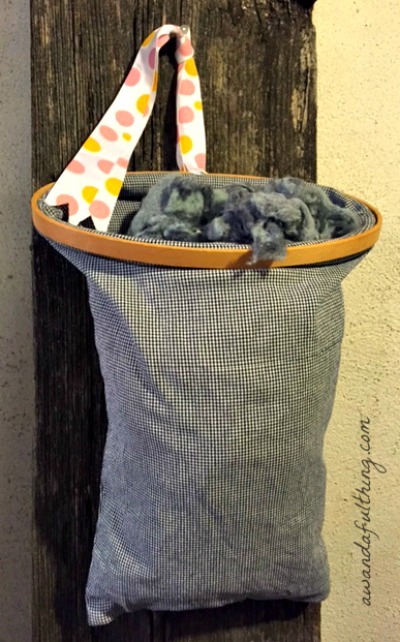 As soon as I saw it I knew I wanted to make a laundry room lint bag. This would make a great craft stash holder too. I didn’t want to spend a lot of time sewing so I dug in my fabric stash and found an old pair of pants that hadn’t been cut into material scraps yet. I eyeballed how big I wanted the bag to be and made a straight cut across the pant leg. I turned it inside out, folded and tucked the material around the inner embroidery hoop, then added the top embroidery hoop piece. Once it was securely in place, I sewed up the bottom of the bag using the hemline on pant leg as my guide. I flipped it back to the right side and added a left over piece of ribbon for a little whimsy. 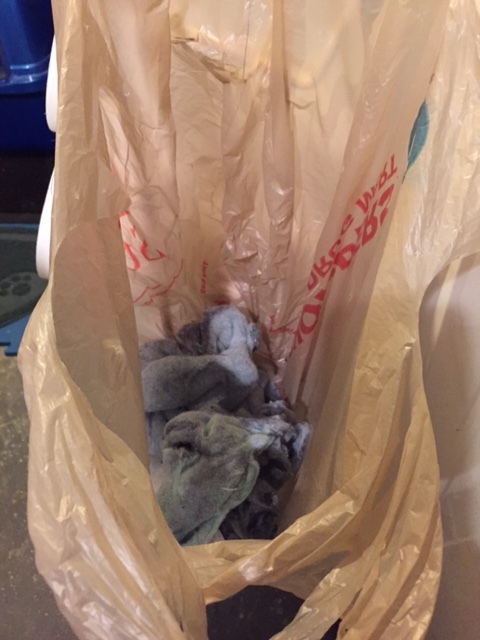 Here is a picture of what I was using as my laundry room lint bag, U G L Y and B O R I N G! 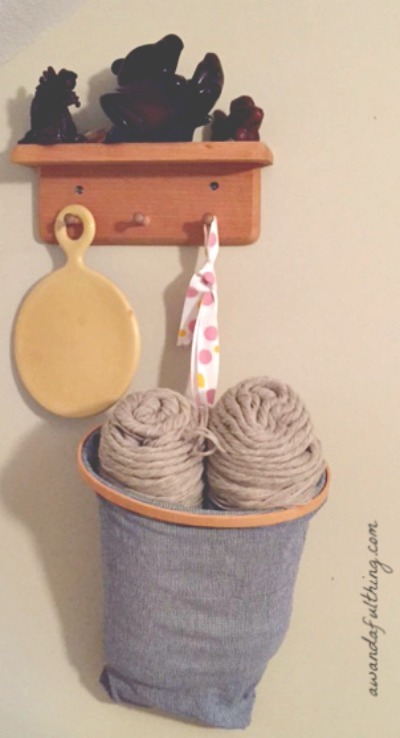 Before I took my newly made lint bag to my laundry room, I tested it out in my craft room as a yarn holder. I like it better as a lint bag. Be sure to check out Amelia’s embroidery hoop craft challenge over at You Can Always Start Now. She had a box full of needle work that included pillowcases, doilies, runners and throws that her mother had made over the years. Amelia saw a picture of someone putting their treasures in an embroidery hoop and liked it so much, she made one as well. 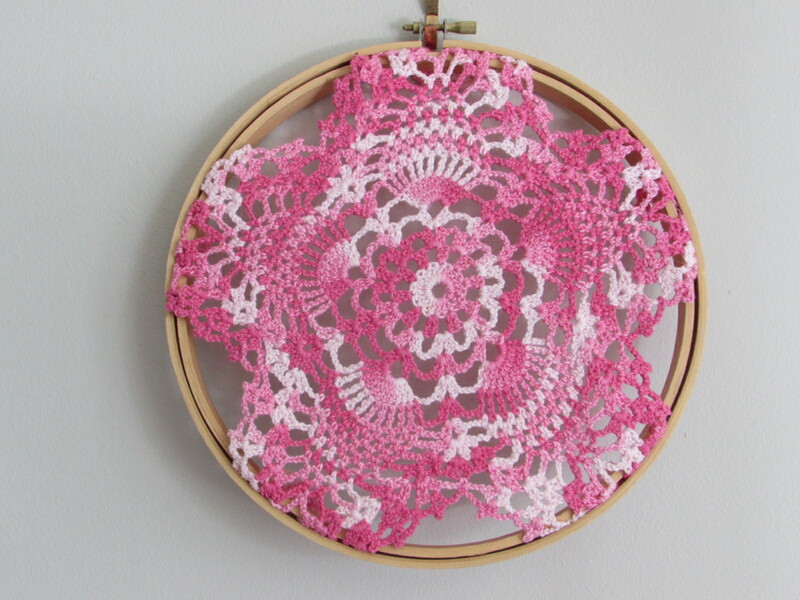 I just love the variegated pink doily. 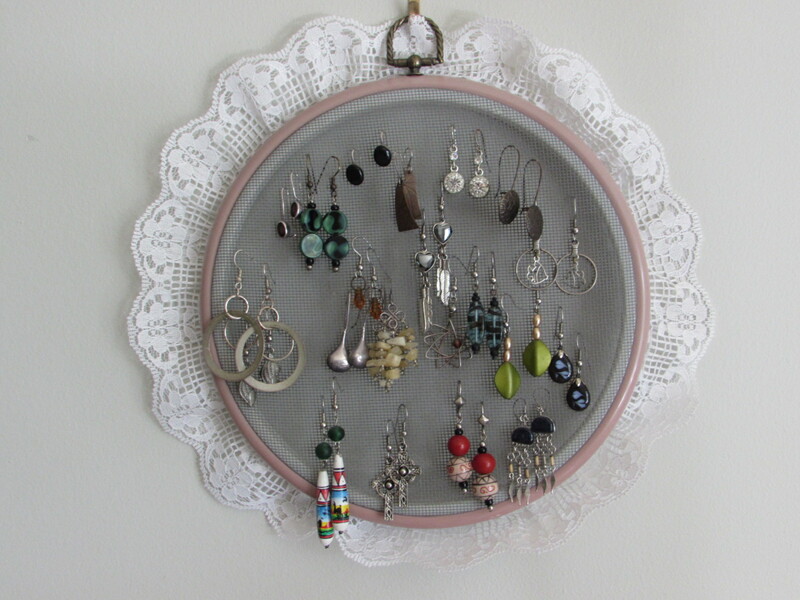 Her sister got in on the action and made an earring holder by adding some fine mesh inside an embroidery hoop and embellishing it with some pretty lace. It is wonderful to create something you need and can use to decorate your space. We had fun doing this challenge looking forward to what next month brings. Be sure to Mark Your Calendar for July when we will be crafting using fabric. This entry was posted in DIY, Make and tagged challenge, cheap, Crafts, Decorate, DIY, easy, embroidery hoop, material, pants, repurpose, reuse, ribbon, sew, thrift store. Bookmark the permalink.